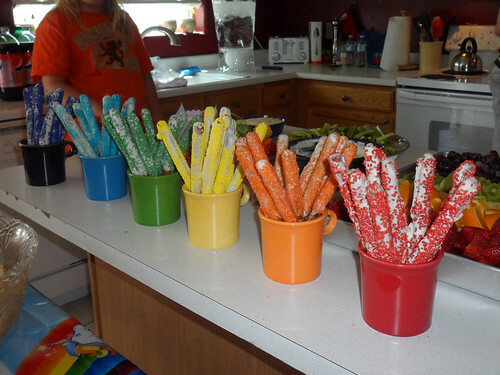 Whenever I host a party or want to give someone a little something special I make chocolate dipped pretzel rods. The Snyder’s of Hanover Pretzel Rods are my personal favorite with Merckens Chocolate Melts. Certainly something to make for the special people in your life. Heat chocolate in the microwave using a microwave safe dish. Microwave for 40 seconds. Remove from the microwave and stir. Continue this process doing 20 second increments in the microwave until chocolate is smooth. Dip pretzel in chocolate and use a spoon to cover top half of rod in chocolate. Gently tap pretzel on side of dish to remove excess chocolate. Sprinkle your favorite sprinkle over the wet chocolate. Do this over a pie tin so that your kitchen doesn’t become covered in sprinkles. This is a great time to get your kids involved. Kids love to cover things in sprinkles. Place completed pretzel rod onto a parchment paper lined cookie sheet. Once I have a whole sheet full I like to pop them in the fridge for a couple minutes to fully firm up the chocolate. When the chocolate is firm store them or wrap them up for your special someone. Do not store them in the fridge because the pretzel will get stale. For this party I created 10 of each color and showcased them in matching Fiestaware mug.